At a press conference held at UN Headquarters on July 20, US Secretary of State Pompeo stated Presidents Trump and Putin discussed how to return Syrian refugees who had fled the war-torn country during their behind closed doors meeting in Helsinki on July 16, 2018. The following is a report filed by: RadioFreeEurope/RadioLoberty on July 20, 2018. The Russian Defense Ministry said it had sent a proposal to Washington to jointly organize the return of Syrian refugees to their homeland following agreements reached between the Russian and American presidents at their summit in Helsinki. The ministry reportedly sent Washington a proposal for drawing up a joint action plan to bring Syrian refugees living in Jordan, Lebanon, Turkey, and elsewhere back to the places where they lived before Syria’s civil war broke out in 2011 — a goal repeatedly espoused by U.S. President Donald Trump since taking office. The Russian Defense Ministry says it has sent a proposal to Washington to jointly organize the return of Syrian refugees to their homeland following agreements reached between the Russian and American presidents at their summit this week. The ministry said on July 20 that it sent Washington a proposal for drawing up a joint action plan to bring Syrian refugees living in Jordan, Lebanon, Turkey, and elsewhere back to the places where they lived before Syria’s civil war broke out in 2011 — a goal repeatedly espoused by U.S. President Donald Trump since taking office. ”Specific proposals on how work could be organized to ensure that refugees can return home have been sent to the American side,” senior ministry official General Mikhail Mizintsev said in a statement. He said the proposals “take into account the agreements reached by the Russian and American presidents during their meeting in Helsinki” on July 16. The summit included a two-hour meeting between Trump and Russian President Vladimir Putin during which they discussed Syria, Ukraine, and other world affairs with no staff present other than interpreters. Little is known publicly about what was said or agreed to in that meeting. But U.S. Secretary of State Mike Pompeo confirmed on July 20 that the return of Syrian refugees had been part of the presidents’ talks. ”There was a discussion between President Trump and President Putin about the resolution in Syria and how we might get the refugees back,” Pompeo told reporters at UN headquarters in New York. 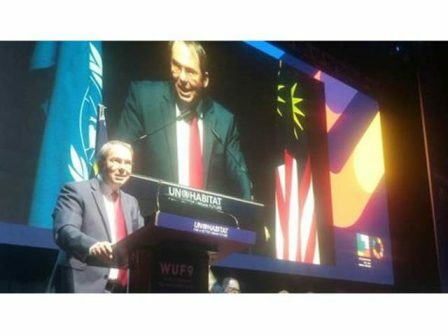 ”It’s important that at the right time, through a voluntary mechanism, the refugees are able to return to their home country,” he said. Washington and Moscow back opposing sides in the Syrian war, with Russia’s intervention on the side of President Bashar al-Assad having helped turn the conflict in favor of the government, particularly in the last year. The proposed joint plan of action on refugees is remarkable in that it appears to presuppose that the war is coming to an end without a negotiated settlement and the country is now in a resettlement and reconstruction phase — a view often espoused by Russia but not previously openly endorsed by Washington. Assad’s troops, backed by Russian air power, have made substantial gains on the battlefield in the last year, including retaking rebel-held areas in the largest cities of Aleppo and Damascus, and most recently regaining control of Syria’s frontier with Israel and Jordan — gains which were all made possible by Russian-brokered surrender agreements with rebel groups. In addition to putting forward a plan to deal with Syria’s refugee problem, Mizintsev said Russia has also suggested forming a joint group with the United States to finance the reconstruction of Syrian infrastructure, which he said in most cities has been 70 percent destroyed by the war. ”The Russian proposals are currently being examined by the U.S. side,” he said. Russia has frequently sought help from the West to help resettle and rebuild Syria, but Western nations in the past have refused to assist in efforts that did not involve the UN or proceed from UN-sponsored efforts to negotiate a settlement of the conflict. The proposed deal with Trump may be the first to officially endorse Russia’s leading role in efforts to rebuild and resettle the country without UN involvement and with Assad still fully in control of the government. In the refugee resettlement plan, Mizintsev said Russia has proposed setting up a joint Russian-U.S.-Jordanian monitoring group in Amman and a similar group in Lebanon — two of the countries where most of Syria’s estimated 6 million refugees are living in refugee camps. 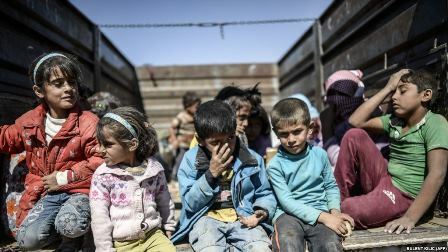 The Russian ministry estimates that over 1.7 million Syrian refugees would be able to return to Syria in the near future, including an estimated 890,000 refugees from Lebanon, 300,000 from Turkey, and 200,000 who are living in European Union countries. While most refugees fled to neighboring countries, thousands sought to start new lives in Europe and the United States, with an unprecedented wave of migrants from the embattled country contributing to a historic migrant crisis in Europe in 2015 and 2016. Since taking office, Trump has put a high priority on stemming the flow of refugees from Syria, claiming they represent a security threat to the United States and its allies. One of his first acts was to issue an executive order temporarily halting the U.S. refugee program for Syrians and barring the entry of all other visitors from Syria and six other mostly Muslim-populated countries. 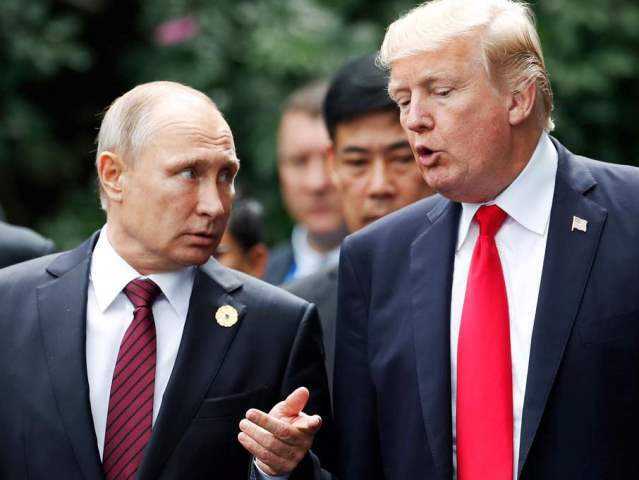 Putin has frequently criticized Europe’s effort to take in and accommodate the hundreds of thousands of Syrian refugees who have sought asylum there, while Trump has called for efforts to make it possible for the migrants to return home. The U.S. and Russia currently have a communications link in Syria to avoid accidental military clashes, but the Russian proposals to work on refugee resettlement and rebuilding together would significantly expand their cooperative efforts.